This work was inspired Jean-Luc Godard’s flim “Pierro le Fou”, in which Jean Paul Belmondo’s character says, “my eyes are a machine to see with”. This “movie” uses the city as a backdrop, and the audiences are the leading actors to complete the film. The screen that separates the audience from the image is removed, and the films point-of-view comes from the anonymous masses. Participants act out the scene as they interact with the unknowing gaze; they create their own movie in their minds for an imaginary audience who may or may not know what is going on. This work was produced in the wake of the 2008 global economic meltdown. 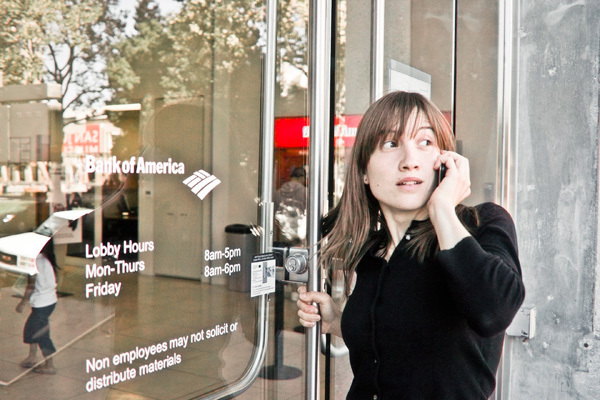 When participants received their phone call with instructions for a bank robbery, the significance of financial capital and the impact of this system on the individual incited the real actions. The exploitation of neo-liberalism that has left them feeling powerless was recalled—as they contemplate their response. This immersive and interactive movie and game changes reality into action, and a fictional plot becomes more real than reality itself, confusing the audience’s understanding of the real world with a “virtual” game.